Come weekend and with a friend from mainland visiting, the first thing that I wanted to do is EAT! Naturally - since my dream during my final year here in university is to review as many restaurants as I can. Although money is always a constraint, but dining out once a week should very much be allowed. Soho, in the UK is well known to be a red-light district and boosts a similar name elsewhere across in New York. Here in Penang, it is very much a British concept pub, which serves food typical to the public houses in the UK. 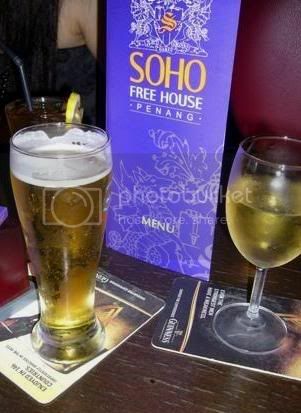 Located at Upper Penang road, Soho is a half club/half pub and a restaurant all in one. A hard to be missed double story building which is usually choked with tourists. I had been there for drinks but never there for its food until recommended by a Penangnite who frequents it. So last Friday, I needed a place to eat and to review and decide to give Soho a try. The lower floor has a bar, pool tables, dart boards and a dance floor and upstairs is mainly for dining purposes. I always loved the upstairs of Soho, with its lush interior wall carpeting, mini chandeliers, deep red curtains which boosts a very grand atmosphere, a solid wooden bar and my favorite part of it, an old fashioned balcony overlooking Upper Penang Road – the place where Penang’s party scene happens. 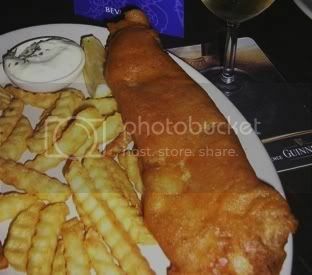 I was told that Fish & Chips lovers will not be disappointed with the one in Soho. Deep fried fish fillets to the scrumptious, in crisp yellow batter, with a dash of salt and pepper, - It is simply delicious. My friend ordered just that and another pal, ordered the roasted herb chicken. 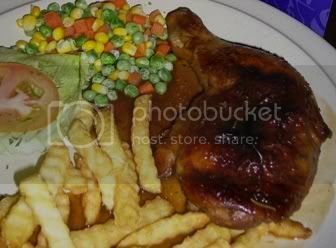 Roasted chicken that comes with a serving of homemade mashed potatoes and boosts thick gravy, a recipe by Soho itself. I had Grilled lamb chop which honestly, the best lamb chop I had in years. 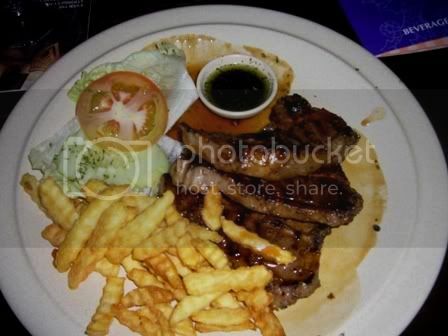 Delicious lamb chops that is first marinated in their own concoction, served in mint sauce, chips and a garden salad. The chops are thick and succulent and grilled to perfection. Soho is also the only pub in town that serves Kilkenny beer, all the way from Ireland and I was told that this waterhole probably boosts the cheapest beer in town. So if you are from out of Penang, looking for both cheap booze and the party scene, Soho is the best place to be. its one of our fave place to hangout whenever we go to penang. last time small pub but now expanded upstairs and sideways too.